With Franchise mode not being as deep as I’d like, I’ve once again gravitated towards Ultimate Team in NBA Live 18. I’ve mostly been playing Ultimate Team since NBA Live 14, and this year, I’m quite happy with how my squad is shaping up. I managed to complete the 2018 All-Star Fantasy Challenges before they expired, and I now have a formidable team that includes Scottie Pippen, George Gervin, and the All-Star Kyrie Irving and Stephen Curry cards. I’d still like to strengthen my team at power forward and centre, and snare a few more historical players. With any luck, a few more in-depth challenges will be pushed through before the NBA Live 18 content updates end. As far as NBA 2K18 is concerned, I’ve mostly been playing 2K Pro-Am with our official NLSC squad, GrindTime. I’m way behind in MyCAREER, but as long as I’m taking part in Pro-Am games, I’ll probably go back to it in order to keep grinding up my player. I did reach 90 Overall over the weekend, which was my minimum goal on the Road to 99. I am still toying with the idea of starting a MyLEAGUE, most likely using the “Start Today” option, and quite possibly with the Minnesota Timberwolves. With my inability to dunk, there is a part of me that’s tempted to try starting another MyCAREER, but it would be a long grind to say the least, so I’m not sure about that. I suppose it technically isn’t playing, but I would like to get back into some modding very soon. I had visions of releasing a new version of my Ultimate Jordan roster on February 17th to celebrate Michael Jordan’s 55th birthday, but I haven’t had time to work on it. I’d like to set aside the time to get it done though, and am targeting March 28th to get some kind of substantial update out, since that will coincide with the 28th anniversary of his career high 69 points against the Cleveland Cavaliers. I have some other modding ideas that I’ll hopefully be able to get to in 2018, time permitting of course. Although it can be tedious at times, the lure of modding is strong. There’s always the temptation of some retro basketball gaming as well. I still have my NBA Live 06 Dynasty and NBA 2K13 MyCAREER saves, and it might be fun to try revisiting them. Of course, the older those games get, the harder they are to go back to for an extended period of time, even though I consider both to be great games for their time, and two of my all-time favourites. 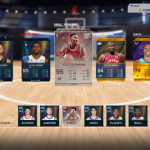 If I get to a point where I’m growing a little weary of Ultimate Team, I may also look to MyTEAM, though I have to say that I wasn’t impressed with the ten cards I received from my pre-order packs, both on PC and PlayStation 4. Perhaps MyLEAGUE would be the better way to go this year. In any event, that’s what I’m currently doing on the virtual hardwood, and what I may yet do before NBA Live 19 and NBA 2K19 are released. With that being said, which game and what modes are you playing right now? Let me know in the comments, and as always, be sure to join in the discussion taking place in the NLSC Forum! While you’re there, don’t forget to contribute to our NBA Live 19 and NBA 2K19 Wishlists, as we’d like to submit them ASAP. It does seem like a pretty solid mobile game. It’s not my thing, but hats off to EA for their success with it. Good writeup as always; MyTEAM has replaced franchise mode for me as well, just like Ultimate Team has done for you. Let me ask you this (I’m cavs4872 on the forums): how often do you guys run Pro-Am? PS4? When do you usually play and how many players are on the roster? I have an 85 OVR rebounding defender SF; would that be of any use? It’s funny you mention starting another MyCAREER… if only you knew what I’ve been through brotha… I actually made a minimum height/weight/wingspan/shoulders/everything playmaking slasher PG that was able to dunk right out of the gates, so it’s interesting your guy can’t do that. It’s also funny you mention the retro gaming, as I’m considering picking up a copy of NBA 09: The Inside again just for the lulz. Yes, we’re on PS4. We’ve got four regulars at the moment, and we generally play Friday evenings, Australian Eastern Time. We probably could use more rebounding, as our AI power forward tends to let us down in that department. 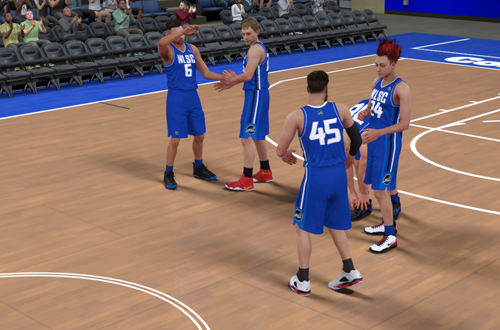 I have actually started a second MyCAREER for testing purposes, once again looking into the dunking issue. Sure enough, the new one dunks just fine. 2K Support was completely unhelpful about the issue, sadly. I don’t know if I’ll do much with the new one; it’d cost 190,585 VC to get to 85 Overall, and there’s all that grinding for Badges as well. Cool. I know this is not the answer you are looking for, but VC is on sale until tomorrow (I took advantage of it). My guy is 6’9″ and I can play the 4… add me; my PSN is “birdman711iffy”. I don’t really use a mic and you are 15 hours ahead of me, so the chances we ever cross paths is slim, but you never know. I might have to buy the NLSC shirt with some of the extra VC I’ve acquired too. My first build was a 6’7 two-way slasher. Man, I could dunk on anyone and play lockdown D, but I couldn’t hit a jump shot to save my life. It was pretty frustrating not being able to hit 3s, or even have a consistent midrange game. I managed to grind (and pay) up to an 89 overall before my new build. My second build is a 6’4 shot-creating sharpshooter. Very fun build to play. Hits tons of shots, still plays lock down D, and dunks regularly. I’ve got him up to an 88, and like you, I just really want to see him hit 90. I long to see those colors change from the 80’s to the 90’s! But it sure seems to slow down a lot the closer you get. Seems like the more you grind, the slower it gets. By the time we get our players to a decent rating, it’s time again to buy a new game. Such is the business, I guess. I admire those efforts to grind up the second player! Looking at how much an effort it would be, I’m not sure that I can do that. I may just end up making do with my broken build. Lesson learned, though. Maybe wait to see if there are any issues before investing too much time (and real money) into building your player right away at launch!